Before you get Enchanted with Ella, try this fun activity! 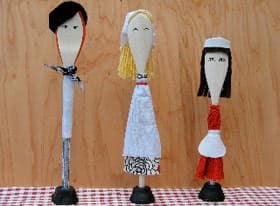 Kids can get creative transforming kitchen implements into fun characters like poor Ella, who is forced to serve her greedy stepsisters, or the good and heroic Prince Charmont. 1. Start by making a stand for the spoon or spatula. Evenly trim the top of the egg carton cup. Then, turn it upside down and use the craft knife to cut an asterisk-shape in the bottom. Paint the outer surface of the cup black and set it aside to dry. 2. Next, cut out a wig of felt to fit the bowl of the spoon or spatula, as shown, and glue it in place. To add bangs, glue a fringed felt semicircle to the front of the spoon. If you'd rather make a yarn wig, simply gather together a few dozen strands and tightly tie another strand around the middle of the bunch. 3. For a servant outfit, fashion a dress by loosely wrapping fabric around the spoon handle and tying yarn or embroidery floss around the neck to secure it. Add a white fabric or felt apron. Then tie a white fabric kerchief around the hair, or glue on a white felt maid's hat. To outfit a Prince, create pants by tightly wrapping fabric around the lower spoon or spatula handle and gluing down the edge of the cloth. Loosely wrap and tie a white fabric jacket around the upper handle, and then add a neck bandanna. For the prince's black hair, cut out two 2 1/2-inches-wide black felt circles. Cut a slit in the center of one circle. Then glue the two circles together along the edges. Insert the top of the spoon or spatula into the slit. 4. Pencil facial features on the face of the spoon or spatula. Once you have them the way you like, trace over the lines with black permanent marker. 5. Insert the spoon or spatula handle into the stand. It should fit snugly; if not, apply a little glue around the opening.